It’s been a great weekend in Bosnia. THE IRELAND SEVENS have won the Rugby Europe Division C tournament to take another significant step along the road to Olympic qualification. After making light work of Austria and Turkey in the quarter and semi-finals respectively, Anthony Eddy’s side capped a great weekend with a 50-0 defeat of hosts Bosnia in this afternoon’s final. Ireland, who had recorded three emphatic wins yesterday, continued their excellent form on Sunday as they swept all challengers aside in sweltering conditions in Zenica. Finishing inside the top four this weekend means Ireland are promoted to the Division B tournament, which takes place in Croatia on 20 and 21 June. The highest ranked team from that weekend then qualifies to participate in the Olympic Repechage tournament where the winner has the chance to secure the last spot for Rio 2016. 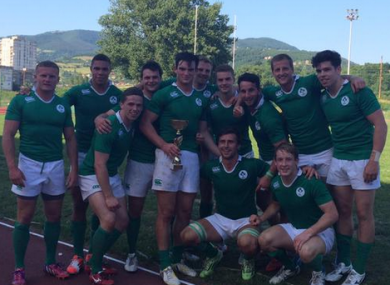 Email “Ireland Sevens move one step closer to Olympic qualification with tournament win ”. Feedback on “Ireland Sevens move one step closer to Olympic qualification with tournament win ”.